When we sit down to a breakfast, we shouldn’t have to worry that the stuff floating in the bowl of milk being carcinogenic and having neurological and reproductive effects. The government has known about this teensy problem with cereal (and potato chips, French fries, crackers, bagels, cookies and pretzels) for 10 years. Swedish government scientists discovered this problem and it has been verified by many other studies and scientists. Yet, our government has done nothing for 10 years to bring this to light. (They’ve known about a major health concern for 10 years and forgot to tell you). They are telling us to follow “dietary guidelines” – you know, the USDA guidelines called the Food Pyramid and My Plate. They are telling us to keep eating the very foods that they know are carcinogenic, neurotoxic and causing reproductive problems – potatoes and grain foods, preferable 6-11 servings of bread, crackers and cereals. Women eating the highest amount of acrylamides in their food were shown to be 31% more likely to develop breast cancer and were more likely to have oxidized LDL cholesterol, a risk factor for heart disease. 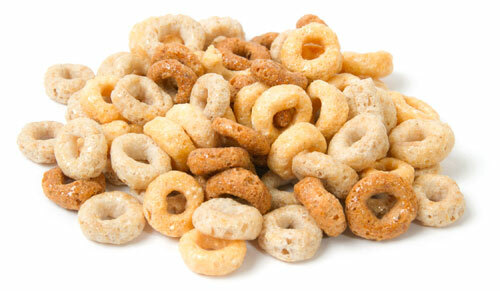 Which cereal is among the worst in terms of high levels of acrylamides? Cheerio Killers, again! Yet, I know people with high cholesterol are eating bowls of Cheerios because they were told by their doctors (and the box) that it will lower their cholesterol. Cheerios and a high carb diet full of bread, crackers, cereal, chips, pasta and sugar will lead to cholesterol problems, inflammation in the arteries, weight gain, and blood sugar problems. Cheerios will not fix anything. Acrylamides are most likely to form when potatoes and starchy carbs are heated above 248 F. Cereal, chips and French fries! Even eating 1 ounce of chips per day exceeds safety levels. It doesn’t matter if the food is organic or not, gluten-free or standard American factory fare. The problem is with preparation methods where temperatures exceed 248 F.
What can we do to avoid acrylamides? In previous newsletters I have written extensively about the harmful effects of processed food packed with dyes, preservatives, chemicals, MSG, antifreeze (propylene glycol), car wax (carnauba wax), and genetically modified ingredients (not labeled, so you don’t know you are eating them). Not only are the added chemicals harming us, killing brain cells and doing untold cellular damage, these high carb foods are leading us by hand into the worst obesity and diabetes epidemic we have ever seen in human history. Kids today are being fed these cereals, crackers, fries and chips delivered in colorful packages with all kinds of false and misleading “health” messages on the front of the package. They say, “5g whole grain, Low Saturated Fat, No Cholesterol. Eat real food that comes out of the ground or had a mother, not products produced in factories and food labs. Vegetables, fruit, seeds, nuts, wild caught fish, pasture-raised chickens, eggs, and animal foods. Get back in the kitchen and learn how to feed yourself and your family. Eat foods that nourish and build the body. Instead of boxed cereal, bagels, processed food bars and donuts for breakfast, take a few extra minutes to prepare a real food breakfast. Want to see more Real Food Breakfast Pictures? We have given control of our food supply to people who do not care about health as much as profits and shelf life. Take the first step tomorrow morning! Get up 10 minutes earlier and make yourself a lovely breakfast with eggs, meat and veggies. Be sure to use a good fat like butter or coconut oil! You will be amazed that you will not even think about food until lunch. Why? Because this is a meal that balances the blood sugar, feeds your cells, nourishes your body and leaves you feeling satisfied!